Any wildfire detours will be published on July 21nd. Until then, plan on the same course as 2017 and 2018. The CTR: 500 miles and 70,000' of elevation gain winding through the Colorado Rocky Mountains between Denver and Durango. 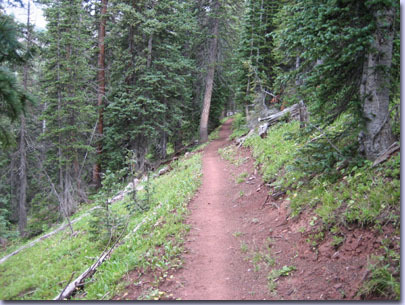 Approximately 300+ miles of singletrack at elevations ranging from 5500' to a gasping-for-breath 13,200'. The CTR is a monster! If the monster is in a good mood, you may experience Colorado's beautiful sunny blue skies and wildflowers blooming as far as you can see! But, be warned — the CTR's mood can change on a whim, and you may just as likely find yourself getting besieged by massive hailstones and lightning bolts. In short, don't come to this race unprepared — no one will be there to rescue you. 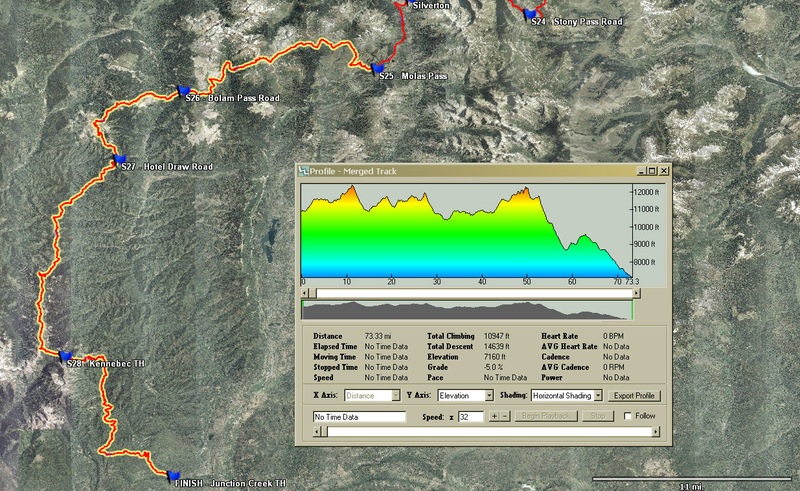 The CTR is similar to The Arizona Trail 300 and Tour Divide. There is no entry fee, no support, no registration, and no prize money. It is a self-timed ITT (Individual Time Trial): all that is provided is a route description, a suggested start time, and a list of results. 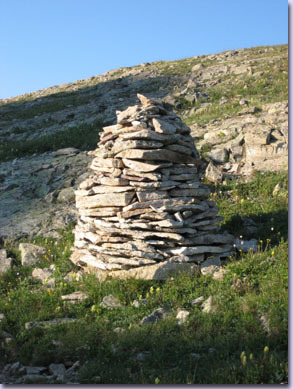 However, all individuals participating are strongly encouraged to donate time or money to the Colorado Trail Foundation. Without them, we wouldn't have this trail! 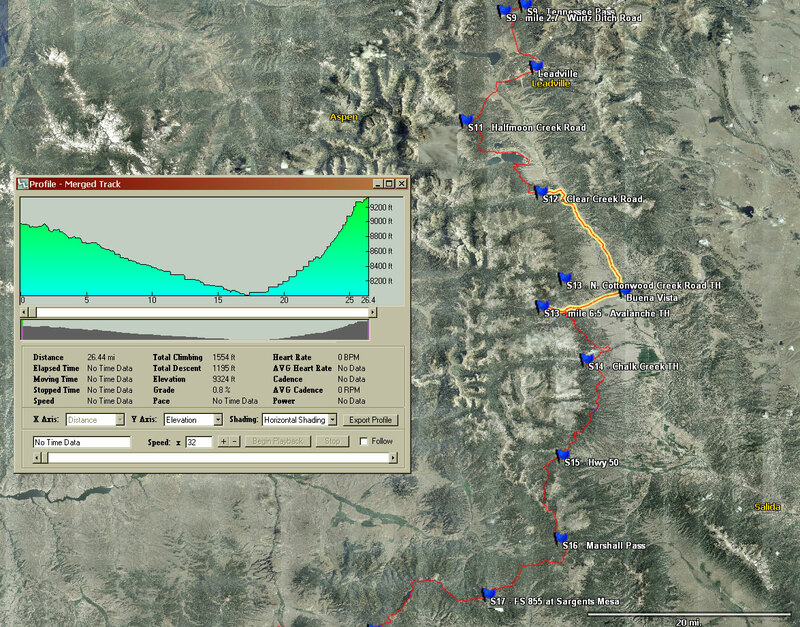 Race from Durango to Denver, self-supported, under only your own power, along the entire CTR route. No pre-arranged support, with the exception of maildrops to a post office and only a post office. Not clear enough? Read the CTR rule FAQ. 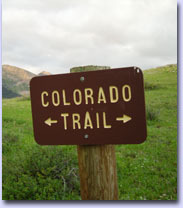 For the most part, the Colorado Trail is very well marked. However, The Trailside Databook is a must-have for a breakdown of each segment with mileages and elevations. The 5th edition (available June 2013) will has marked bicycle detours that match the CTR Detours. Any shortcutting or deviating from the course, intentional or not, will result in a DNF, so please study the route and know it well! You may, of course, ride off course to resupply/sleep/eat as long as you return to the exact same spot you left. 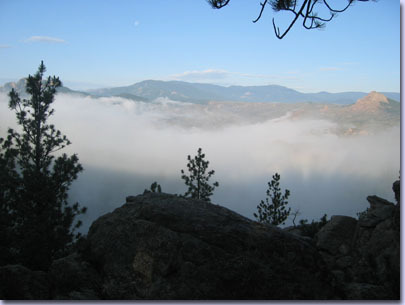 The 2019 CTR starts in Durango and uses the Tarryall Detour as described in the offical Colorado Trail guidebook. There are many, many segments of the CT with prodigious amounts of hike-a-bike, and also segments with miles on end of high alpine riding. In particular, the Cataract Ridge segment is not a good place to be during an electrical storm. So come prepared to do some hiking and to exercise good judgment regarding the weather. Here is a terrific CT Trail Bikepacking Guide put together by Craig Fowler. NOTE: The mileage and elevation gain in this graphic are underestimated. Also, the course has changed to include Tarryall detour, so this graphic is inaccurate. To generate this graphic (and much more!) yourself, download Topofusion, and open the supplied .gpx file. The 2018 .gpx file is unchanged from 2016 and 2017, and was stitched together by Toby Gadd. Please see Toby's blogpost to download it. Thanks again, Toby! Potential re-routes to be posted here prior to the race. 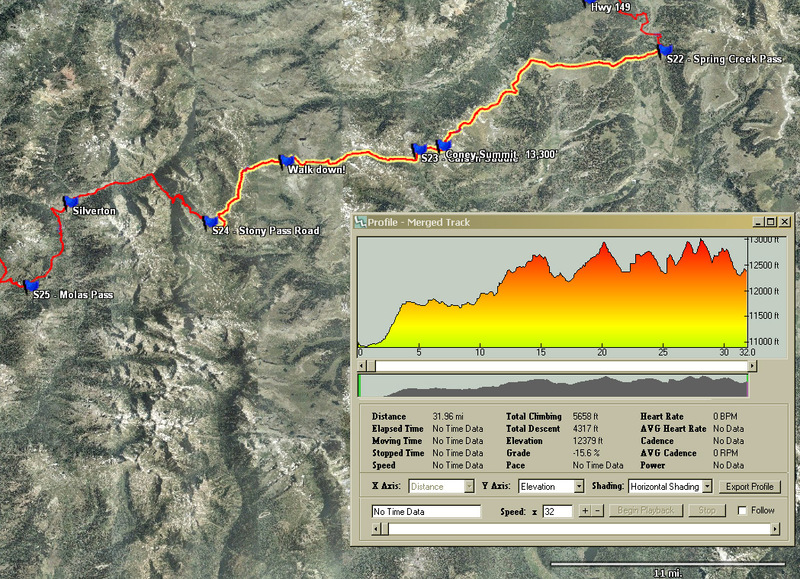 Wellington Lake Road to Waterton Canyon - Ride Segments 1, 2, and 3. Lost Creek Wilderness Detour - From Wellington Lake road, follow the bike detour through Tarryall as described in the official guidebook. 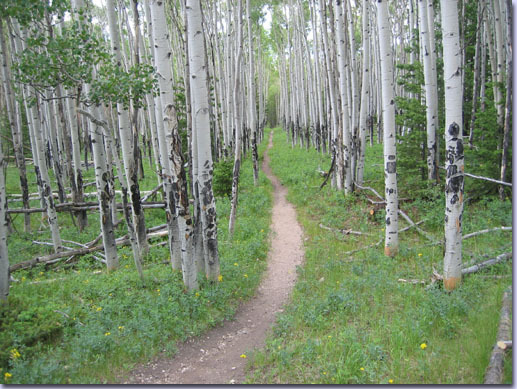 Rejoin the Colorado Trail for the last few miles of segment 5. Note: 7th edition and older guidebooks start the detour prior to Wellington Lake Rd., but you will ride an extra 2 miles along the CT to Wellington Lake Road as indicated in the 8th edition guidebook. 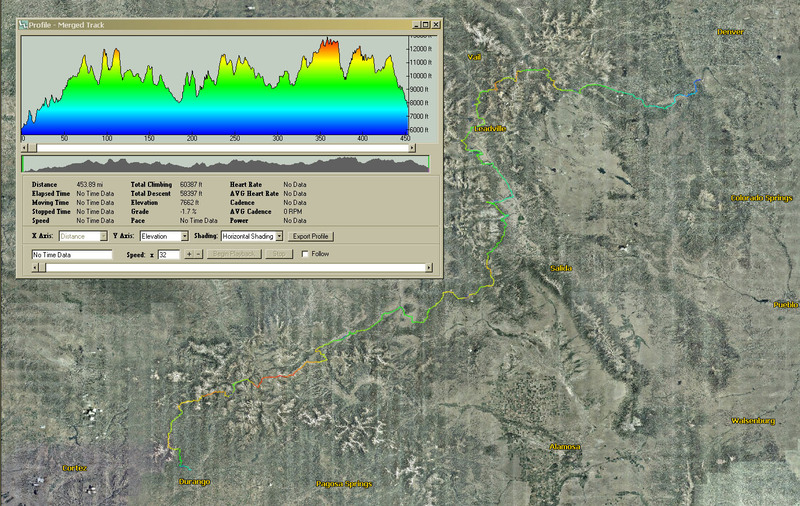 Kenosha Pass to Wurtz Ditch Road - Ride Segments 6, 7, and 8. Ride the first part of Segment 9 to Wurtz Ditch Road. 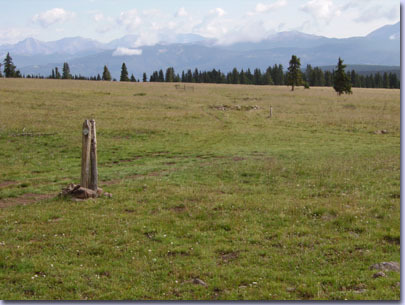 Holy Cross / Mount Massive Wilderness Detour - Left on Wurtz Ditch Road, left on FS-100, right on US-24 to Leadville. South of Leadville, turn right onto Hwy-300, then left onto Halfmoon Creek Road. Regain CT @ Halfmoon Creek TH and start of Segment 11. Halfmoon Creek to Clear Creek Road - Ride Segment 11. Note: Do not ride the alternate old Hope Pass route. Collegiate Peaks Wilderness Detour - Left for 3 mi. on Clear Creek Road, right for 5.9 mi. on US-24, left on Rd-371 for 10 mi. on old railroad grade to B.V. Right on Main, across US-24 at light which becomes Rd-306 (Cottonwood Pass Road for 10 mi. to Avalanche TH. This is mile 6.6 of Segment 13. 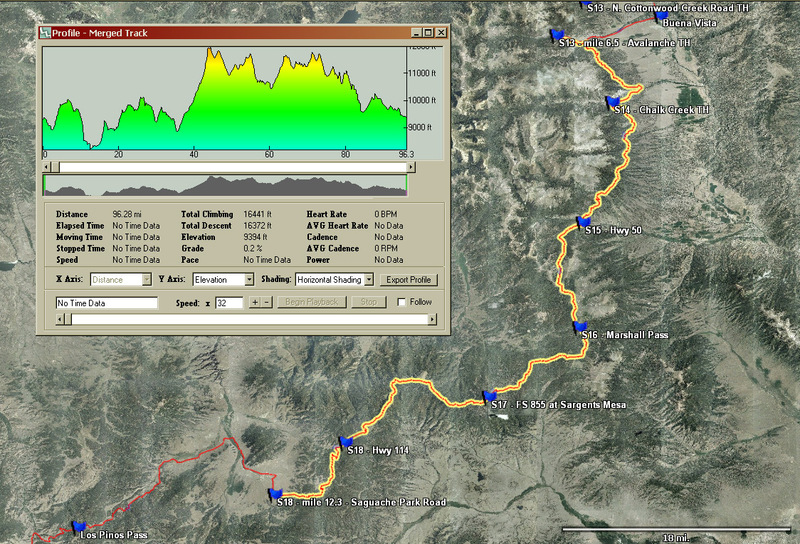 Avalanche Trailhead to Saguache Park Road - Ride the remainder of Segment 13, then ride Segments 14, 15, 16, 17 and 18. Leave segment 18 at Saguache Park Road to start the La Garita Detour. 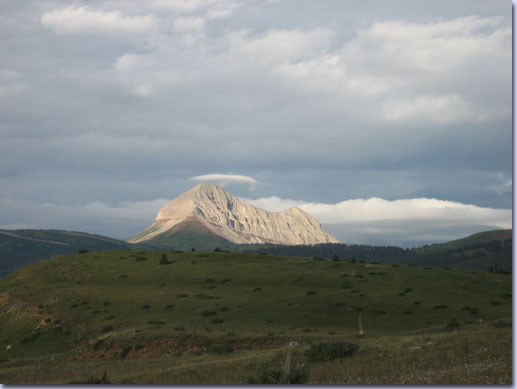 Note: 7th edition and older guidebooks start the next detour at Cochetopa Pass Rd., but you will ride an extra 6.5 miles along the CT to Saguache Park Road, as indicated in the 8th edition guidebook. 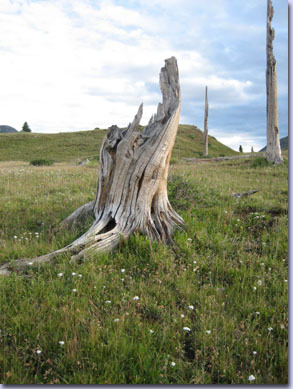 La Garita Wilderness Detour - Go right on Saguache Park Road for 2 miles, left on NN-14 for 5.8 miles, left on KK14 (Los Pinos Pass Rd.) for 24 miles, left at Cebolla Rd intersection for 15 miles to Hwy-149. Left on pavement for 7.6 miles to Spring Creek Pass and start of Segment 22. Spring Creek Pass to Stony Pass Road. - Ride Segments 22, and rerouted (Cataract Ridge) segment 23. Note: This reroute is included in 7th Edition "Revised" and newer guidebooks, as well as the CT Databook, 4th Edition and newer. Pay close attention to the Trailside Databook at the start of Segment 22!. Weminuche Wilderness Detour - Go right on Stony Pass Road and descend to Silverton. 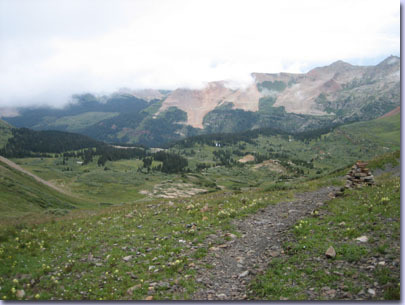 Climb the pavement up to Molas Pass and the start of Segment 25. 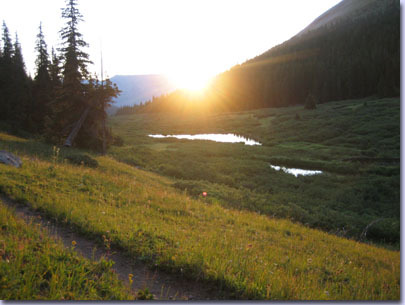 Molas Pass to Junction Creek Trailhead - Ride Segments 25, 26, 27 and 28. If you've never done a multi-day endurance ride, don't start with the CTR! Training and prepping for this beast is daunting and all-consuming. If you're looking for guidance, Dave Harris and Lynda Wallenfels have put together a 12-week CTR specific training plan. Dave and Lynda are well known in the multi-day endurance mountain biking circle, and best of all, they are donating 10% of all proceeds from the sale of this plan to the Colorado Trail Foundation! 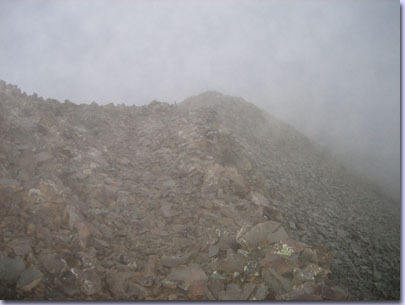 In 2009, the course changed to use the Hwy-285 Detour through Bailey instead of Tarryall, as well as adding the Tenmile Range (segment 7), Coney Summit (segment 22), and the newly constructed, gorgeous Cataract Ridge (segment 23). In 2013, the course changed once again to use the long, mostly-gravel Tarryall Detour instead of US-285. The Tenmile Range and Coney/Cataract Segments were kept making the CTR as true to the actual Colorado Trail as possible for Mountain Bikes. In addition, we started from Durango in 2013. In future years, the start will alternate between Durango and Denver. 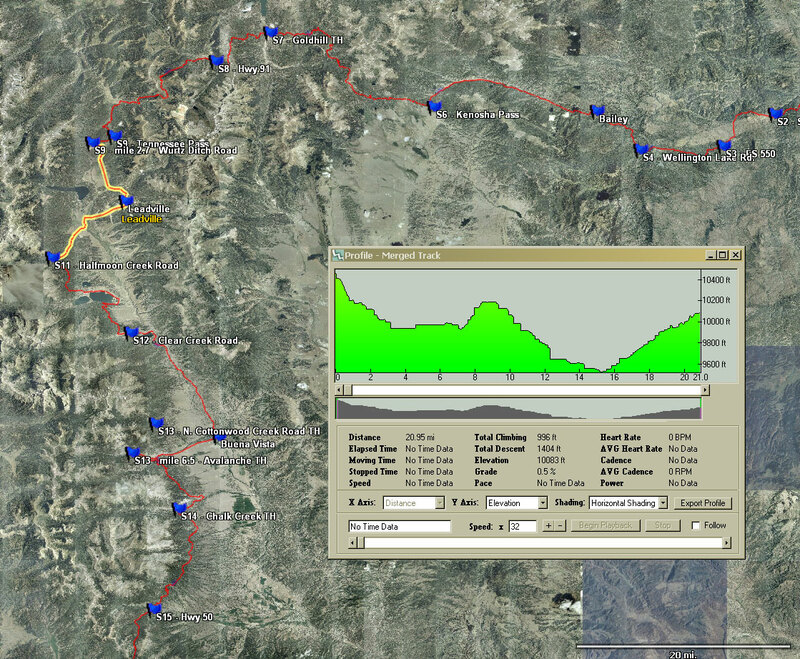 The course records starting from Durango include the prologue from downtown Durango to the Junction Creek TH. 2018 CTR Results: Denver Start, Tarryal Detour and Tenmile/Coney/Cataract Segments. 2017 CTR Results: Durango Start, Tarryal Detour and Tenmile/Coney/Cataract Segments. 2016 CTR Results: Denver Start, Tarryal Detour and Tenmile/Coney/Cataract Segments. 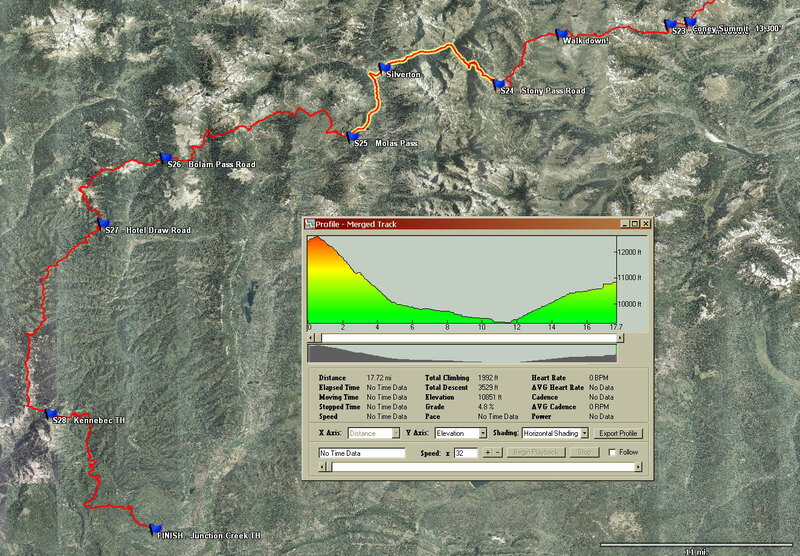 2015 CTR Results: Durango Start, Tarryal Detour and Tenmile/Coney/Cataract Segments. (Time includes prologue from Durango to Junction Creek TH. 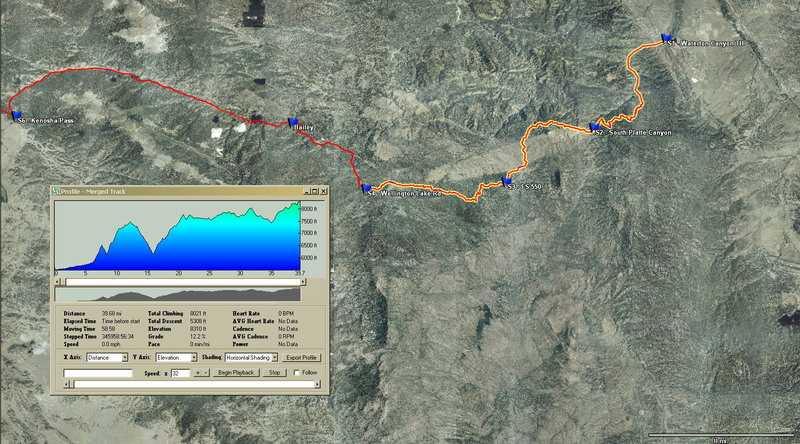 * Unfortunately, Tim and Christian missed the 2-3 miles of Jarosa Mesa on Segment 22. Same spot that Ethan and Owen spent time exploring in '09, and that Scott missed last year. Perhaps there are STILL a couple of CT markers along that old jeep road. (!?!) We gotta tear those out so this doesn't keep happening? 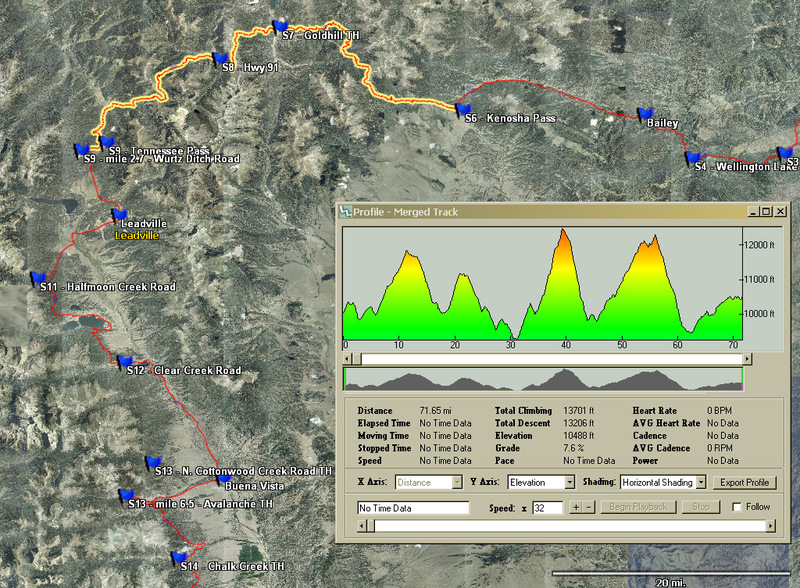 2013 CTR Results: Durango Start, Tarryal Detour and Tenmile/Coney/Cataract Segments. 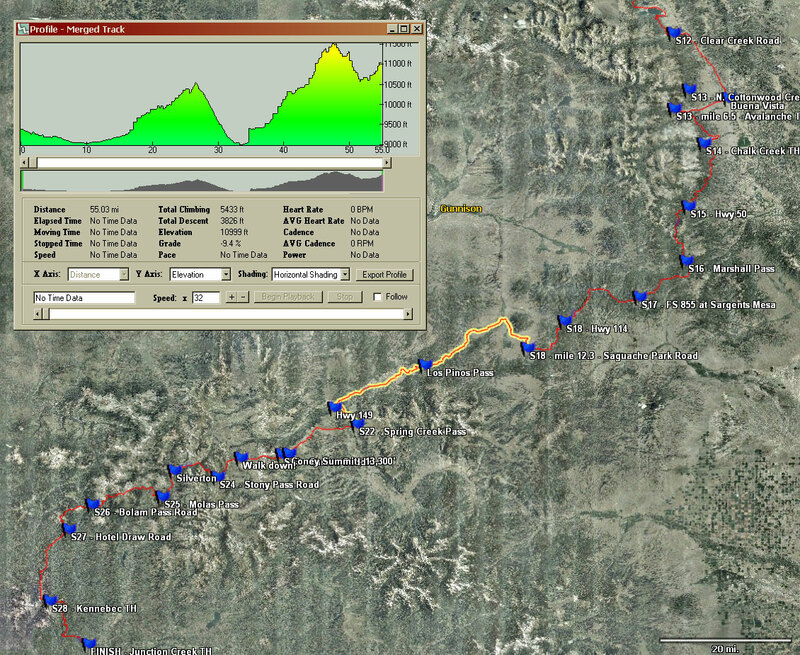 (Time includes prologue from Durango to Junction Creek TH. * Unfortunately, Scott missed the 2-3 miles of Jarosa Mesa on Segment 22. Same spot that Ethan and Owen spent time exploring in '09. Turns out there are a couple of CT markers along that old jeep road. (!?!) Any volunteers to go rip those out so this doesn't keep happening? I stopped listing DNFs for the last 2 years because it was getting too hard to keep track of them all. There are 30+ more not listed, but Chris Neumann's story needs to be told. He was 15 miles from Junction Creek TH when things went horribly wrong. A short note on finish times. Doug Johnson - Swan River Rd. 4d03h20m - Owen Murphy Course Record!!! CTR Course Note: In 2009, both the GPS track and data/guidebooks indicated the CT as following a jeep road from above Twin Lakes down to a campground before rejoining a ST. However, new CT markers indicate the trail as following some older ST and newly built trail instead of the jeep road. Because of this discrepancy, either route was deemed acceptable. Ethan missed a short 3 mile section of trail over Jarosa Mesa on Segment 22. This is the same section that Owen missed, but then somehow realized it, and backtracked to the actual CT.
Dan, Nick and Tom all rode Cinnamon Pass instead of Coney's + Cataract (Seg. 22/23) Similar mileage, but perhaps 4000' less elevation gain and no hike-a-bike. 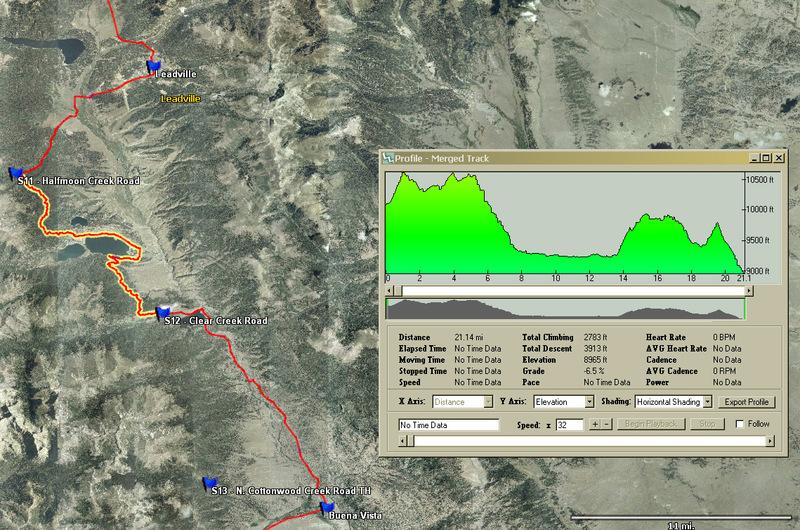 Jason inadvertently skipped the middle of segment 18, starting the La Garita Wilderness detour at Cochetopa Pass Rd. instead of Saguache Park Road, only realizing this almost a year later. Owen inadvertently skipped the end of Segment 3, thus riding 5 miles and ~800' less than the actual CTR route. He only realized this upon closer inspection of the detours for the '09 race. Clearly, he still would have crushed the course record.